Gingerbread games for preschoolers through second grade. Math Activity: Cover rectangles of cardboard with aluminum foil to make “cookie sheets”. Glue on half a dozen gingerbread men, each with a number from 0 – 10 or higher, depending on the ability of the child. Use Cheerios for counters. Children decorate each gingerbread cookie with the number of Cheerios written on it. I pre-bake one gingerbread man for each child. (I use refrigerated sugar cookie dough to save time.) In the morning I read “The Little Gingerbread Man”. Then the children Ice and decorate the cookies. We put the cookies on a foil-lined cookies sheet. The children go with me down to the oven to pop the cookies in the oven. ( I know what your thinking, but I teach 3’s and 4’s, and in 10 years no child has ever caught on to the fact that they’ve been baked already, or that the oven is cold!) We make a big deal out of closing the oven door VERY tightly! Then we go back to our room and, while I do group time, the other teacher takes the cookies to another part of the building. She sets them upright on a bench, lined with a strip of paper towel. She also delivers notes to other teachers in the building. The notes are part of a scavenger hunt (the first note goes in the oven on the empty cookie tray. 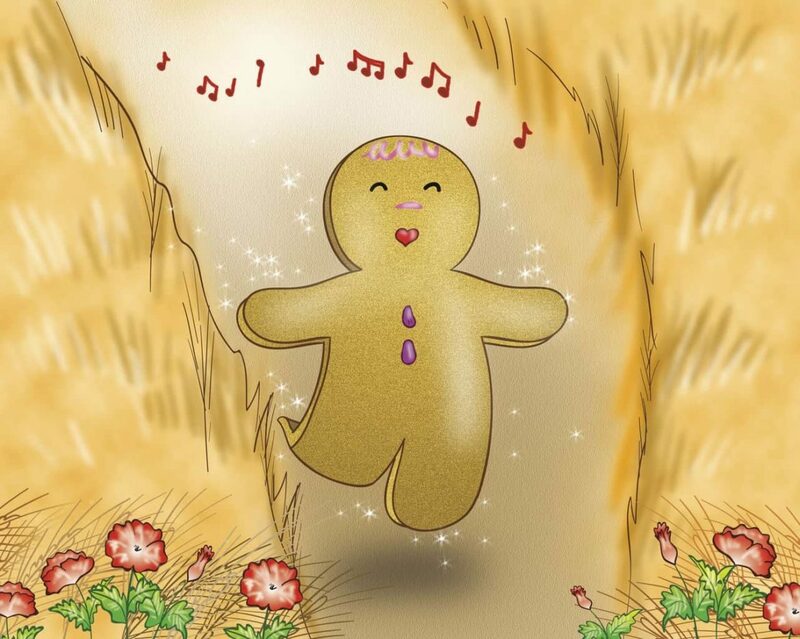 All the notes start with the familiar line from the Book; “Run and run as fast as you can, You can’t catch me, I’m the Gingerbread Man!” Then the note might say; “I got bored in the oven, I could not wait. If you want to find me, ask Mrs. Tate!” Off we go to Mrs. Tates room! She has the next note. We follow the leads until we find the little guys! As a language extender, we write down the children’s answer to the question; “How did those gingerbread men get out of that oven!? !” Their answers are hysterical! The kids talk about this activity all year long! We read the story of the gingerbread boy. After that I have a gingerbread man that has the poem “run run. . . ” and then it tells the children to follow his footprints to a special treat and we followed footprints that are on the wall, floor, ceiling, etc to where our snack (gingerbread men cookies) are hidden. I cut out two different sized gingerbread “people”. The small set I put buttons and faces on. Each person had a number ( i.e. 1 – 1 button, 2 – 2 buttons etc.) The large gingerbread people had faces and numbers but no buttons…I then put a basket of buttons out on the table with both sets of gingerbread people. The children enjoyed putting the right number of buttons on the large ones and matched the numbers and “self-corrected by using the small set of people. On the first or second day of school, I have a treasure hunt for the children to help learn about the layout of our school. However, I borrowed this fun idea from one of my own children’s teachers. The night before I bake a large gingerbread person (the entire size of a cookie sheet). I hide this in the school kitchen (or any other room – discuss with the staff beforehand). The day of the treasure hunt I read the story of the gingerbread boy. Next, we tour the school asking each classroom if they’ve seen a missing gingerbread person. After we locate the missing gingerbread person, we return to the classroom and eat this yummy treat. The preschoolers love this! This is one of my favorite gingerbread games. After a week of gingerbread activities, my class rewrote the story of little Gingerbread boy with the prompt of “There was a class who had no man, so they decided to make a gingerbread man.” The children put him in the oven and get busy playing. They forget about the gingerbread man until they smell him burning. The children named the animals that the gingerbread man ran away from and then drew the pictures for a class book. Take an appliance box, a refrigerator box works best, and cut it open. (Be sure it will stand on its own.) Cut out a door and some windows. I like to cover the windows with holiday saran wrap to look like candy-coated window panes. Frame it with a corrugated border to look like frosting. Ask the students to make glittery “gumdrops” to put along the roof. Add any other candies to add a festive look. I make this with my students in December when we study the Gingerbread man and/or holiday baking.